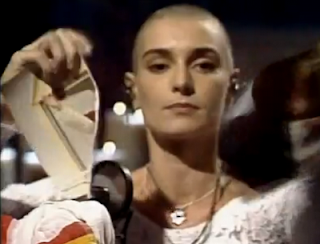 The first time I saw Sinéad O’Connor, in 1990, I was in awe. I watched her stark video for “Nothing Compares 2 U,” struck by both her voice and her presence. She looked at us unblinkingly from those enormous eyes, her shorn head serving only to emphasize her delicacy, her voice like blown glass daring us to really listen. I loved the song, but more than that, I loved her presence: She seemed steadfast and self-possessed but fragile. Her talent shone, of course. But so did her beauty. I’d say I’m displeased by how she’s been treated in the media, but the fact is the media I consume has been treating her with the care and thought her career deserves. Salon points out that we can’t expect celebrities to remain untouched by time, calling the initial hubbub over her August appearance her “latest shocker”; The Hollywood Reporter asks us to “leave Sinéad alone” and reminds us that she was a singer who rose to fame because of her talent and outspoken views, including a rejection of the beauty mold: “Should a singer who used her window of fame to highlight discomfiting political opinions as well as bringing hauntingly personal songs like ‘Troy’ and ‘Three Babies’ into the musical canon really be judged by the same harsh standards that are common currency for actresses and reality TV stars?” Yes, her appearance prompted some snark—but do we really expect better from TMZ, or even abcnews.com, which was less poking fun at her and more taking the chance to put together a celebrity slideshow they knew would garner page views? Even the reviews that questioned her looks made it clear that her voice was still splendid, and the Telegraph captioned the accompanying photo with “Comfortable in her encroaching middle age,” which, while focusing on her looks, also communicated that her looks weren’t to be trashed, but instead were something that happens to most of us. It almost seemed like a compliment. So I’m actually pretty pleased overall with the way that the media has been examining O’Connor. But besides the general questions that can be applied to female celebrities pretty much across the board—for starters, why we expect singers to be professional beauties, and why we expect famous people to stay forever preserved in youth and then mock the ones who do stay preserved for not “aging gracefully”—it seems like there’s something else that made us want to take another look at O’Connor, something that makes us rush to defend her, that makes even vicious sources us a bit hesitant to rush in for the kill. (TMZ, hardly known for being gracious toward its subjects, called her “softer” and “matronly” instead of flat-out “fat” as it has for other celebrities, including Janet Jackson and Britney Spears.) And that something else is her long-standing tussle with the beauty standard. Much like how Gloria Steinem was a convenient poster girl for feminism because of her conventional good looks (which brought its own criticisms, but undoubtedly it did something to help make feminism more palatable to the masses), Sinéad O’Connor could speak to the part of us that wanted to shirk the beauty standard but still reap a few of its benefits. Hell, enough with “us”: She spoke to that part of me. 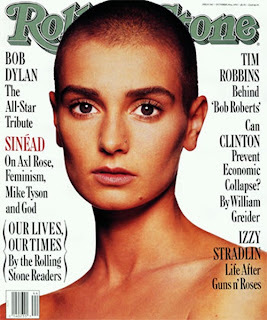 When I first discovered Sinéad O’Connor, rejecting the beauty standard hadn’t occurred to me in the slightest. I was deep in the awkward stage, and the beauty standard was something I was eager to jump into headfirst. So when I saw the video for “Nothing Compares 2 U,” in addition to liking its simplicity and the song itself, I danced on the edge of awe and something approximating irritation. Here she was, born with the chiseled features and elfin frame I was lacking, and she was rejecting her rightful status as the pretty girl by shaving her head? Frankly, I was little annoyed, as though by all rights the beauty she was rejecting should somehow be channeled to a certain 13-year-old instead of merely wasted—which is, indeed, how I saw it at the time. With time and political consciousness, my baffled state morphed into admiration. Actually, it morphed more into just fandom: I no longer looked at her as the extraordinarily pretty woman with the unfortunately shaven head, but rather as a singer-songwriter who had some subtle yet ferocious work out there: I still get chills when I even think of the sweeping violins and shattering vocals on “Feel So Different,” and “I Want Your Hands On Me” is one of the sexist songs in existence, for my money anyway. In short, I started to see her how she probably wished to be seen. Now, if I’d been 31 instead of 13 when I first heard O’Connor, I might have seen her more in that light to begin with instead of taking the more circuitous route—being in the “awkward stage” can dictate some acrobatic thinking in regards to looks. But I’m also pretty sure that by virtue of being a mainstream entertainer who was bucking the beauty standard, Sinéad O’Connor was initially seen as the beautiful bald chick by a lot of people, not just confused adolescents. Somewhere between the dulling of the novelty factor and the infamous Pope-picture Saturday Night Live appearance, we moved past that, but her looks became an integral part of how she was seen. And, of course, that hasn’t changed. It hasn’t changed for her detractors, who sneer at her rounded belly and ask what happened to the waif we first eyed more than 20 years ago. But it also hasn’t changed for her supporters, I don’t think. I felt indignant when I first read about the criticisms of her current appearance—forgetting that I was reading those very criticisms in a piece that was saying that the criticisms were inappropriate. My anger stemmed not from what anyone might be saying about a singer-songwriter I like but had largely lost track of, but from reactions to someone I’d held up as a model of how to buck the beauty standard. And the sting was made worse by the fact that I too could look at the recent photos of O’Connor and see not the defiant beauty of 1990 but a normal-looking woman with an unflattering haircut and odd clothes. I’d never criticize her looks (or anyone’s, for that matter), but I saw what her detractors were saying, and it felt frustrating. An icon for rejecting the beauty standard had moved into the arena of having it reject her, insofar as it rejects any of us who don’t fit the mold of being thin and white with doll-like faces. I had to admit that there was a part of me that continued to get a deep satisfaction from seeing a conventionally beautiful woman buck the beauty standard—as though somehow it means more for Sinéad O’Connor to shave her head than it would if someone with unremarkable bone structure were to do so. There was a part of me that still wanted that sort of trailblazing protection from a standard-bearer: Look, I did it, it’s okay for you to do it too. And I know better. I know that the beauty standard has little to do with what any individual woman looks like and more to do with how women as a class are seen. I know that while the struggles of a conventionally beautiful woman may on the surface differ from an average-looking woman or a homely one, they’re all masks covering the same core. That doesn’t mean I don’t fall for it. I tend to make minor heroes out of women of all stripes who actively work against the beauty standard—and there’s a part of me that gazes on conventionally beautiful women who do so with the inverse of an old woman’s cluck, “Such a pretty girl, would it kill her to put on some lipstick?” I think, Such a pretty girl, good for her. In other words, I’ll see her first as the pretty woman with the shaved head, and only later will I learn that the girl can sing. I’m holding onto the beauty standard in a different way than the architects of society—but at the end of the day, I’m still putting a prize value on it. Appearance obviously the first thing we see about people, and I can hardly reproach myself for noticing Sinéad O’Connor’s looks. It would be disingenuous to claim that the goal is to somehow see through someone’s looks, to peer into their soul—which can happen with people we know to varying degrees, but really not with celebrities, with whom we form relationships based largely on static images. But I can wonder what it means for women, and for the power of beauty, when I narrowly manage to skirt falling into the mainstream beauty standard trap we set for women, only to find myself in a more benevolent version of the same contraption. I've never heard an O'Connor song, but it sounds like I should! I'll work my way through your favorites. Oy, beauty standards. I spend so much time thinking about this, but my thoughts run in circles. "Remember what I told you, they hated me they will hate you." Another great entry Autumn. The paradox at the middle of all this: If she'd looked in 1990 like she looks today, she never would have been on the cover of the Rolling Stone. Beauty will always be seductive as long as we have our sight. One of the underlying cultural problems is that male and female beauty are configured and imagined differently, and imbued with totally different power dynamics. There are easily a half-dozen prominent male actors who have the same body shape/type that present-day Sinead has who never get ridiculed, or even singled out for it. Part of it is the stark contrast between the younger Sinead and the present Sinead (not just weight, but hair! male celebs whose appearance yo-yos do get some attention for it, just ask Matthew Perry from Friends) but part of it is that there is not much acceptable space for frumpy appearance among women. There is much more space for it among men. Just ask Phillip Seymour Hoffman. Thanks for the great thoughts on a singer near to my heart! P.S. Put 'em on, put 'em on, put 'em on, put 'em on me! I haven't seen any of the press, but from the picture above, her main problem is the clothes she chose rather than her weight or whatever. She would have passed under the radar even with the changes wrought by time if she hadn't chosen such an incredibly unflattering outfit. (And I'm a big Sinead fan...). I guess she's one of those people who just don't care much about clothes, but as a performer the way she presents herself is part of the performance. People like Adele, the older Aretha Franklin and Beth Ditto could be good inspiration for her. JR, I wonder if character actors have an easier time overall with this--Matthew Perry, while not exactly a leading man, was cast in the mold of "cute guy"; Phillip Seymour Hoffman was not. So he has more latitude than the prettyboys (look at how people liked to mock John Travolta for gaining weight)--and since there aren't as many roles written for character actresses, there's not as much room for them to look like normal human beings. Glad to have had a chance to look into this topic; it's Just Like U Said It Would B.
Eleanorjane, that's a great point--surely she must have realized that wearing an awkward top like that (boxy shoulders and mesh middle?) would be unflattering, which puts it squarely back into her rejecting the beauty dynamic. But because she didn't "pass" this time...let the fire begin. Or maybe she didn't realize it at all? In any case I love the mental image of Adele, Aretha Franklin, and Beth Ditto having a style consult with Sinéad! This is such a wonderful, well-thought-out post. 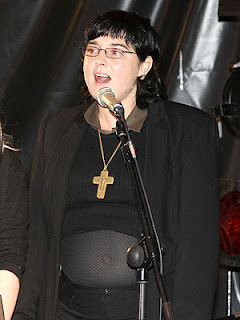 I idolized Sinead O'Connor in high school. She was one of the first concerts I saw, and I wore that purple, oversized concert tee for years afterward! I still listen to Three Babies now and sob every time I hear it: "And it's cause you've thrilled me/ silenced and stilled me/ proved things I've never believed/ Oh, the face on you/ the smell of you/ will always be with me." Oh, my god that breaks my heart! Anyway, I think that there is a big difference between bucking the beauty ideal for someone who is conventionally beautiful vs someone who is not. And I also wonder about that outfit that she's wearing in the latest photo, because it's clearly a fashion choice that causes more of a reaction as opposed to some kind of more unobtrusive garb that might indicate a lack of interest in the way she looks. I don't know, Sinead is such a Goddess and icon that I sort of feel that she can do whatever she wants now. Are you sure that is a picture of her? It looks nothing like her. I did a search of images and that particular photo does not come up. The latest photos online show her plumper and almost totally gray but still mostly shorn and no glasses. The photo above looks much younger than the latest photos on the net of her as well. Kristen, thank you! Totally envious that you got to see her perform! I wish I'd considered the fashion angle when writing this, because both you and Eleanorjane are raising good points about what her clothes communicate. Hi Autumn, I agree with "But it’s easier for us to embrace a woman rejecting the beauty myth as long as she’s still conventionally beautiful—in part because we still then get to focus on the way she actually looks, not what she is actually saying." And I also think the other side of the shaved-head-as-bucking-beauty-standards is that it actually showed off her prettiness more; she must have known how still-beautiful she was even with an unfeminine, stark hairstyle (see: Annie Lennox). A shaved head at least does not say "I don't care" the way weight gain does, it's a way to be striking and show off beautiful large eyes and great cheekbones, and I think that's part of why the weight gain is getting so much attention, because that makes it look like, Oh, wait, you really don't care? Lisa F., that's just it: "Oh, wait, you *really* don't care?" It makes me think of what butch comic Kelli Dunham said about the difference between her wearing a suit and her femme girlfriend wearing a suit--"You're not *really* trying to wear a suit." It was seen as more threatening on Kelli because she was presenting a much more masculine self, which was transgressive. It's the same way with weight gain--that's REALLY bucking the beauty standard. Not that I think women should gain weight to buck the beauty standard, but it's less of a "oh, but she looks cute anyway!" thing in the eyes of the culture. It would have been awfully difficult to 'reject the beauty' standard when she was in her 20's and 30's. Hair or no hair, she had an absolutely gorgeous face and she knew it. In 1990, when Nothing Compares 2 U came out, it's fair to say just about every man had a crush on her and women wanted to be her. She just had one of those flawless supermodel looks. Don't kid yourself, it was a fashion statement to allow her to stand out among the long flowing hair or short spiky hair of the women of her time. It worked very well. Remember, she was there to earn a living first and foremost, in a very competitive market. Unfortunately, time hasn't been kind to her and her voice has dropped since those days. I wouldn't have even recognized her anymore. Even she was confused with the many hair / no hair phases she's gone through. Hi Frank--Certainly rejecting the beauty standard means something completely different for someone as genetically blessed as Sinead who was at the age where women are most seen as objects of beauty. It's a definite conundrum--how much can you really reject it when you absolutely embody it in nearly every way? Anyway, glad to see you here. This is such a great description of why her video for "Nothing Compares 2 U" is still so amazing. I would argue that not a single singer today (Britney, Beyonce, etc.) have the guts to do what she did over 20 years ago - shave her head and spend three minutes staring into the camera. Nigel, it's funny how such a simple thing can be so shocking--and spellbinding.